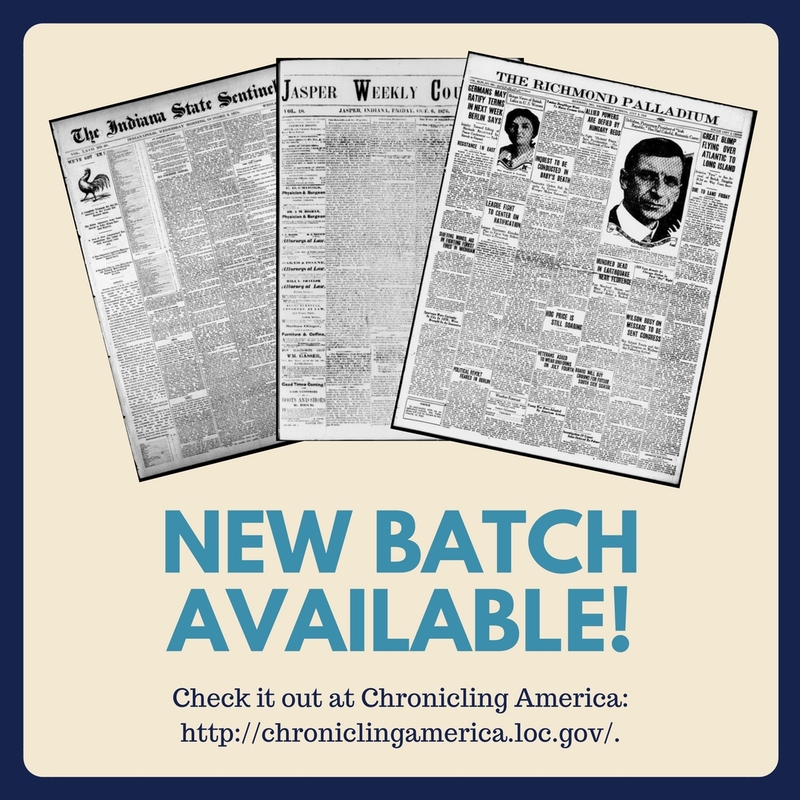 We have a new batch available for you through Chronicling America: http://chroniclingamerica.loc.gov/. This batch comprises 875 issues (totaling 9,934 pages) and brings our total page count in Chronicling America to 309,134! 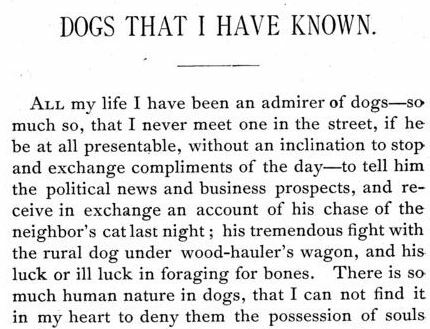 Nature lover, friend of dogs and underdogs, journalistic joker, and shooter-up of men he considered his enemies, George C. Harding once edited newspapers from Cincinnati to Houston but was always most connected with the Indianapolis Journal and the Indianapolis Herald, which he edited in the 1870’s. Part Mark Twain, part Ambrose Bierce, part proverbial “man gone postal,” Harding was called “the most picturesque man in Indianapolis journalism” by city historian J.P. Dunn. Since he wielded a pistol several times in the capitol city and may have suffered from a mental illness, it’s hard to know exactly how to see him today. But since he’s also been mostly forgotten, here’s a bit of his story. Born in Clinton, Tennessee, in 1830 to a family of thirteen kids, the future editor of the Indianapolis Journal lived in Knoxville until age seven. In 1837, the family moved to Edgar County, Illinois, where his father, Jacob J. Harding, eventually edited the Prairie Beacon in Paris, twenty miles west of Terre Haute, Indiana. At fourteen, Harding ran away to St. Louis, but came back “penniless and disheartened” and probably worked in a brick factory. A long obituary published in the Indiana State Sentinel in 1881 says that “When about fifteen or sixteen years of age [Harding] went to Terre Haute and learned the printing art in the office of the Terre Haute Express.” When the Mexican War broke out, he enlisted as a private but got sick (either in St. Louis or New Orleans) and never made it to Mexico. Around 1848, he was co-editing his father’s paper just over the Illinois state line. In the 1850s, he grew restless and floated down the Mississippi to New Orleans, where he may have gotten work as a newspaper correspondent for the Cincinnati Commercial. Before the Civil War, Harding also edited the Courier in Charleston, Illinois, founded the Coles County Ledger in Mattoon, and did editorial work for papers in Louisville, Cincinnati, Indianapolis, and Houston. During the Civil War, the itinerant news man served as Lieutenant in the 1st Indiana Heavy Artillery, the so-called “Jackass Regiment.” (The name came from the Hoosier regiment’s use of mules to haul cannon and supplies.) He saw action at the Battle of Baton Rouge and Port Hudson, Louisiana, before being captured by Confederate cavalry, allegedly while stumbling drunk over a fence. 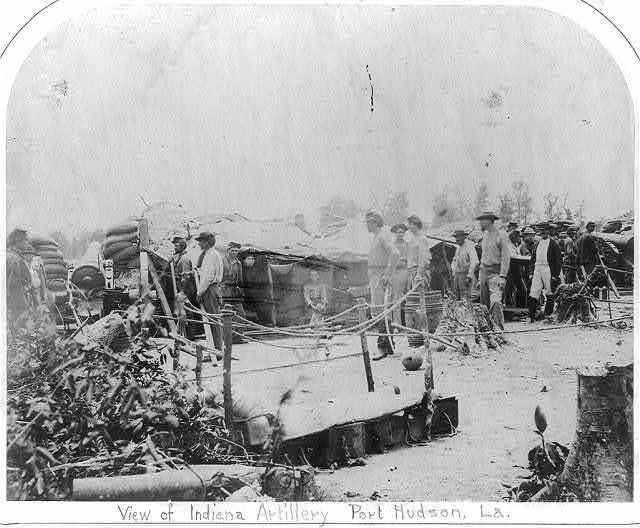 While held as a POW at New Iberia, Louisiana, Harding and two other Indiana captives drank from gourd cups and used ox-shoulders as silverware. Because he had given his word of honor not to attempt an escape, he was freed during a prisoner exchange at Vicksburg, Mississippi, in 1863. Harding’s knife-sharp prose is best when he’s telling the hard truth, though he could occasionally flip on the sentimentality switch if he had to, to sell papers. Resigning his lieutenancy in 1864, Harding took an editorial position for six months on the New Orleans Times and the True Delta. Some of what he wrote down South was reprinted after his death, including a humorous piece called “Duck Shooting in Louisiana.” At war’s end, he came north to Cincinnati to work on the staff of the Commercial, then moved to Indianapolis. Several dailies and weeklies that he wrote for or edited after the war include the Mirror, the Journal, the Saturday Herald, and the Sentinel. Yet the popular editor published several fraudulent stories on purpose as practical jokes, as George S. Cottman remembered in a 1922 op-ed piece on famous Hoosier hoaxes. Charley Ross, the long lost boy, recovered at last. He is found with Italian organ grinders on Potomac alley [in Indianapolis], dressed as a girl and called Telsla. How Detective Hollywood worked up the case. The father and the child at the Grand Hotel. Harding himself was hoaxed by a fake space rock in 1879, as told in Wednesday’s post. Whether the meteorite really killed a farmer named Grover or not, Harding himself tried to kill several men in the 1870s. Hathaway responded with a series of buck type interrogations, for in those days you could evade libel in Indiana by putting a charge in the form of a question. . . The following Friday, Hathway was seated in his office at an old cherry desk with a flap that let down in front, with his back to the door, which certainly was a breach of the most ordinary editorial precaution. Suddenly the door opened. Harding appeared in a “beastly state of intoxication” and began showering the place with bullets as big as birds’ eggs from an army horse-pistol. Hathaway jumped under the imposing table at the first shot. Two printers, setting type at the front of the room, leaped out the open windows at their sides, lit on an awning over an undertaking establishment and rolled off onto the roof of a hearse that was standing at the curb. The horses of the hearse proceeded to run away and started a stampede of other horses. 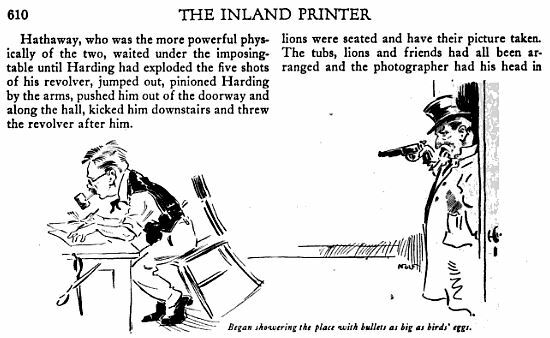 Gibson made the claim (I haven’t been able to verify this) that one of Harding’s bullets grazed a printing machine with type ready to go to press. Later on, Hathaway “set up in large Gothic type an account of the affray, tore out a lot of type paralleling the furrow and set in two brass rules and a line of type: ‘The track of the would-be assassin’s bullet! '” Harding kicked the Independent’s editor down the stairs, but Hathaway survived. He committed suicide in 1911, aged eighty-two. 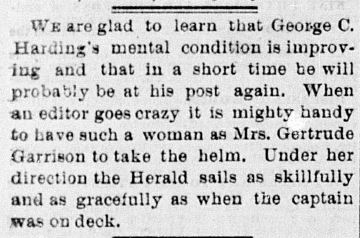 Five years before his assault on labor leader Calvin Light, a tragic suicide had driven George Harding to his most celebrated shooting. Perhaps he was, in fact, mentally insane, but the family tragedy that drove him to seek revenge was very real, and his gun was aimed at another man named Sol. These gentlemen have been warm friends and very intimate in their social relations. Moritz, who is a Hebrew, aged about forty years and married, took advantage of this intimacy and succeeded in seducing Harding’s daughter, who is about eighteen years of age. This was accomplished last March, and improper relations have been maintained by the parties since that time. . . Mrs. Harding, [the girl’s stepmother] has stated that Moritz had also made improper proposals to her. Flora Harding, the editor’s eighteen-year-old daughter, was a talented writer and translator who taught German in the Seventh Ward district school. “During the absence of her father to the Hot Springs [Arkansas? ], she filled the editorial chair and most ably,” said the Sentinel. Flora probably also suffered from lifelong depression and feared the ruin of her reputation. If Moritz had in fact taken advantage of her, she would likely have become an outcast in those days of a strict female “honor” code. Though the bereaved gunman was taken to jail that night, public opinion was overwhelmingly in his favor. 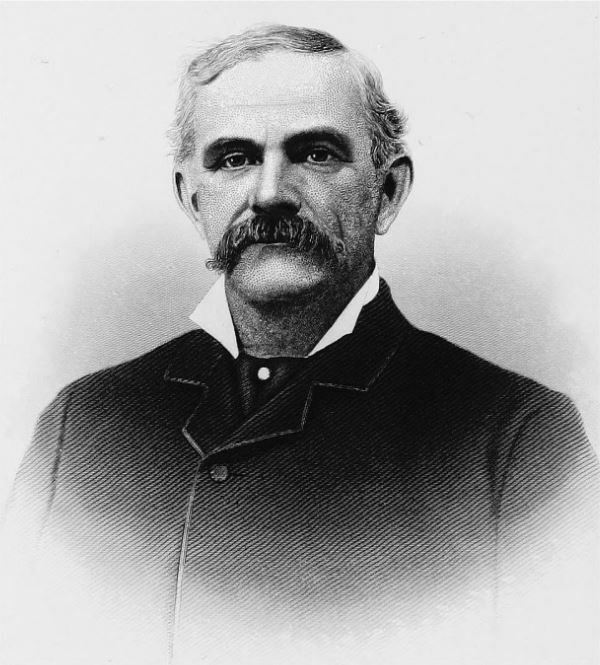 When Harding went to trial, one of his lawyers, Major Jonathan W. Gordon (profiled on this blog during his grave-robbing days), defended Harding on the basis of common law. by her father, brother, or husband with impunity, and in the case at bar the grand jury have, in effect, already said so by returning a bill of indictment for a simple assault and battery. Harding was acquitted, and as the judge announced the verdict, “the pent up feeling of the large crowd broke forth in applause, which was both loud and protracted.” Perhaps this free pass from the state criminal court made the editor consider other public shootings in the future. In 1880, Harding moved to Minnesota, where he had bought the Lanesboro Journal. But “his active brain required more scope,” says the Fillmore County history. 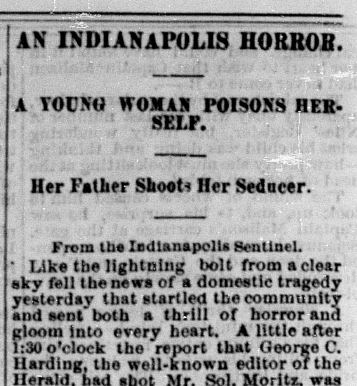 Tragically, in May 1881 George C. Harding had an odd death back in Indianapolis. Dead! How suddenly he went out! Two weeks ago last Wednesday, he was walking along a street in Indianapolis, and stepped aside to allow some ladies to pass. He stepped on a cellar grating, just as a man was raising it. His right foot went into the opening, and the flesh of his leg was cut to the bone. He died at six o’clock last Sunday morning, of congestion of the brain and blood poisoning, resulting from the accident. In the death of George C. Harding, Indiana journalism has lost one of its oldest, most familiar and rarely original characters. . . We know of no one who can take up the pen which Harding has dropped, never to pick up again. . . Dying at the age of 51, his life was cut off in the very midst of his powers. . . there is not another George C. Harding any more than there is another Charles Dickens. Indiana State Sentinel, July 21, 1841. Chronicling America. After shuttering the Wabash Enquirer in Terre Haute, the Chapman brothers, George A. and Jacob P., moved to Indianapolis and purchased the Indiana Democrat, and Spirit of the Constitution in 1841. The Chapmans renamed the newspaper the Indiana State Sentinel and produced its first issue on July 21, 1841. The Sentinel was a Democratic paper and displayed on the masthead the party mascot, a rooster, with the motto, “Crow, Chapman, Crow!” The majority of Indiana’s elected officials throughout the 1840s and 1850s were Democrats, and the Sentinel became the preeminent Democratic organ in the state during these decades and the major foil to the city’s Whig and later Republican voice, the Indianapolis Journal. The Chapman brothers issued the Sentinel as a weekly but produced a daily edition while the Indiana General Assembly was in session from 1841 to 1844. In 1845, the newspaper inaugurated the twice-weekly Indiana State Sentinel. A tri-weekly edition also appeared during legislative sessions. 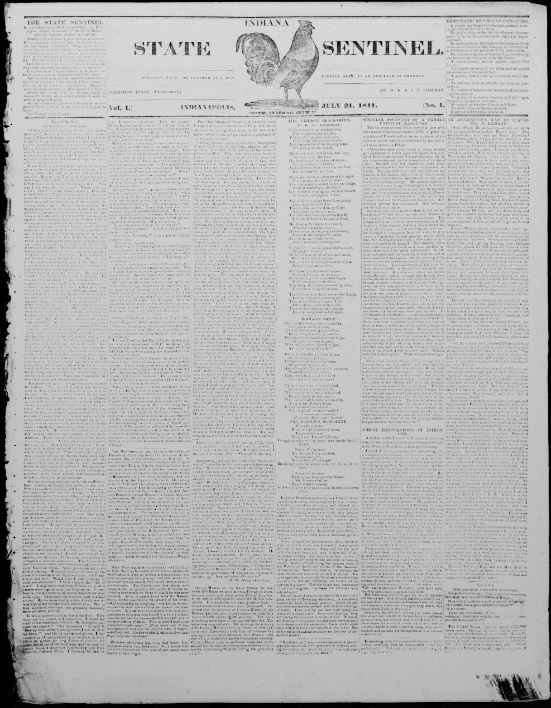 After 1853, the weekly version was called the Weekly Indiana State Sentinel. Austin H. Brown acquired complete control of the paper in 1850 and made it a year-round daily on April 28, 1851. The Sentinel changed hands at least six times during the next decade, which partly contributed to the paper’s loss of influence and subscribers. During the Civil War years, the Daily State Sentinel and the weekly Indiana State Sentinel were vocal critics of the Republican-controlled government. The Sentinel’s editor, Joseph J. Bingham, was arrested by the army for treason and conspiracy. Bingham ultimately turned government witness in the Indianapolis trial by military commission in 1864 of Harrison H. Dodd and others accused of involvement in a Copperhead conspiracy. This turmoil contributed to the decline of the Sentinel. In July 1865, Charles W. Hall and a partner acquired the paper and changed its name to the Indianapolis Daily Herald. Fifteen months later, the newspaper went into receivership. In 1868, its name reverted back to the Indianapolis Daily Sentinel, and there also appeared a weekly edition, the Indiana State Sentinel. The paper continued to change hands until 1872 when it was acquired by the Sentinel Company, which dropped “Daily” from the title. Circulation figures for the daily edition averaged about 6,000 between 1869 and 1888. The name was changed several more times over the next few years before finally returning to the Indianapolis Sentinel in 1880. The Sentinel’s weekly edition, with a strong readership among Indiana farmers and stock-raisers, enjoyed a circulation of 12,000 during this period. 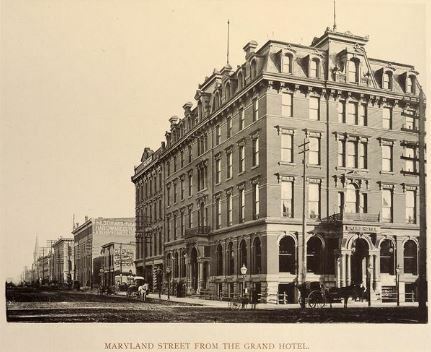 In February 1888, Samuel E. Morss purchased the paper and helped to return the Sentinel to the level of influence it had enjoyed back in the 1850s. Morss came to the Sentinel after editing the Fort Wayne Gazette and Fort Wayne Daily Sentinel and co-founding the Kansas City [MO] Evening Star. According to a contemporary source, the Sentinel under Morss “has been constantly progressive and eminently the advocate and champion of clean politics, good government and civil service reform.” During Morss’s tenure (1888-1903), circulation averaged 18,091 for the daily (which was issued as the Indianapolis Globe for a few weeks in 1903), and 49,389 for the weekly edition. Despite these impressive figures, the Sentinel faced growing competition and financial difficulties. The paper had failed to take a stand on the dominant political question of 1890s regarding free silver and consequently lost subscriptions and advertising revenue. In an effort to lure back readers and to compete with cheaper papers, the weekly subscription rate was dropped from a dollar to fifty cents in 1898, causing circulation to spike to 100,000 in 1901-05. The daily’s yearly subscription was also reduced from six dollars to three dollars. Morss died unexpectedly on October 23, 1903. A group led by Democratic National Committee Chairman Thomas Taggart took over the Sentinel for a few months before Frank T. Baker purchased it. Under Baker, the Sentinel adopted a more sensationalist tone associated with the yellow press. The Indianapolis Sentinel ceased publication on February 25, 1906. The motto “Crow, Chapman, Crow!” reportedly originated in reference to Hancock County, Indiana politician Joseph Chapman, and not the Chapman brothers.